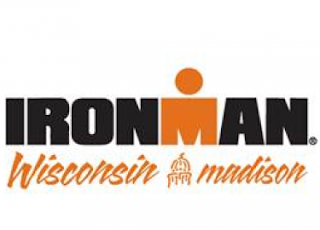 Today I got out there and gave it a go at my 7th Ironman Wisconsin. Living only 1 block from the finish it is tough to miss this event, and it is the only opportunity all year to sleep in my own bed for a pro race. Leading up to the race I kept a steadfast line that "I was tired" and that was the truth. However, despite the fatigue, I knew with the experience and endurance that there was an outside chance that if everything went perfect on race day that I could win Ironman Wisconsin. I knew I would feel tired all week leading up to the race and crossed my fingers that I would feel good on race day. I knew going in that I would need a season best swim to make my dreams a reality. In the warm Lake Monona water I opted to wear a 3mm thick 2XU sleeveless wetsuit. I knew the risk for my body was too high for overheating. It was a smart choice and even though a 5mm full-sleeve wetsuit may be faster in objective tests, personal experience has told me time and time again to be conservative. So with that I lined up for the race and got settled in on the feet of the eventual female winner Jackie Arendt. It was a smart decision. There was even a point where she started to go off course and I stayed on line. I thought about venturing ahead but I have made that mistake too many times this year and instead hopped back on her feet. The result was that I came out of the water ahead of guys I have come out behind all year. It was the swim I needed and I was only 4:30 back from the leaders. Onto the bike and I made some quick progress past a few guys. I was riding ok but not spectacular. On the day it was one of the most challenging Ironman Wisconsin's I have ever done. You wouldn't know it though as men's winner Maik Twelsiek absolutely destroyed the bike course record. After about 30 miles or so I found myself in no man's land. Nobody in front that I could see and nobody in the back either. It was a very lonely ride and I kept expecting to get gobbled up by a large group of guys but it never happened. The last 20 miles or so I completely fell apart on the bike and that is when I needed the power the most as it was mostly a headwind and quite a strong one at that. On to the run and I was in 7th. I knew the win was long gone and the plan was to run 6 miles or so to the turn-around of loop 1 and reassess. If a podium was an option then continue, if not, then continue the first loop and call it day. It was very evident at the turnaround that unless the field completely melted that there would be no podium on this day. So the result is the official record book is a DNF. I do want to thank everyone for the cheers and support!! So although I did not finish Ironman Wisconsin I got what I needed out of the day. One of the hardest things for me to deal with is when I am completely happy with the result but others might not understand this and I know this will be one of those times. I talked early this year with a friend and well known pro about this and despite our discussion and some good advice it is still hard to grapple with it. It is even harder because I am committed to writing every week so there is no hiding from it. And it is only compounded because I smiled a lot out there and so many people acknowledged that and supported me out there. Lastly, it is only further compounded that I felt perfectly good out there. Overall I love the sport and I am committed to my development as an athlete. However, Ironman racing is incredibly tough and finishing today would take away from my ability to do well at Kona. It would have been worthwhile in my opinion for a podium or win in my hometown, but not for 8th. I know so many people would give lots to trade shoes and I don't want to disrespect or take away from anyone's accomplishment on the day. I really do love this sport and the lifestyle, but ultimately I want to win one of these so I hope you can understand this. Looking forward I will reassess this week for my plans regarding Kona. As of now I am planning to head back to Tucson in a couple of weeks but hope to get in some solid training before I leave. I will give some thought about Tahoe but after talking with Mike Reilly and Bryan Rhodes I will probably scrap it. I was wondering what happened! I can't imagine the pressure of doing Ironman professionally! I don't envy the tough decision you had to make today. But like an age grouper might pull out of or not do other races before an Ironman to protect that dream, you as a professional have dreams and goals too and you have every right to protect them as anyone else would. Can't wait to track you at Kona! Keep your eyes on the prize! Hope to see you at my next Ironman! As a mere age-grouper, I don't understand the mentality of you and other pros of "if I don't podium" I am not going to finish the race. How would running the second lap - even at a moderate pace - ruin your chances in a race over a month away? In what other sports do professionals quit - literally - before the end of the game? Anonymous. Thank you for the question. This is a matter of perspective. Unless you have "raced" an Ironman, preferably many and within weeks of each other, and as a pro, it MAY be impossible to understand the decision fully even with explanation but less I try. Ironman's are incredibly hard on the body and no you just can't recover for them at a snap of the fingers. And even if you could recover from them, you wouldn't have enough steam in the engine to do a race to anything close to your potential in one month's time. As a result you have to keep the training going. You can also see that I kept the training going through race week as well. The last half of the marathon is where the majority of the damage is done. It is where the body is already most fatigued and form starts to go out the window. To finish would be a sacrifice at a much bigger event. That would be worth it from a financial / career standpoint for a podium in your hometown but not for anything less in my eyes. This sport is incredibly poor from a pro standpoint and unfortunately we can't race Ironmans every week. It simply wouldn't be smart. Had Ironman Wisconsin not taken place 1 block from where I reside I would have never traveled to the race and done it. With that being said, had I not toed the start line people would nonetheless question why I wasn't starting when I live 1 block from the race start/finish. I would encourage you to take a look at every single Kona qualifier on the pro side and see when the last time they raced an Ironman was. I don't think you will find one that raced later than Aug 25 and there is a reason for that. It takes a long time to recover from an Ironman. I have "raced" IM Wisconsin three times to the best of my ability (recognizing that my ability is not nearly yours). It sounds like you should have never began the race. But you did, and a professional would have finished out of respect for the sport, the fellow competitors, and the many volunteers. I am glad the volunteers at miles 13-26 of the run course didn't quite and stop handing out aid because they weren't "feeling it." Anonymous, if you would like to get into bashing I would prefer that you don't remain Anonymous. What kind of message are you sending by remaining Anonymous. To me it sounds like someone who is not willing to accept responsibility for his/her own words. And isn't that kind of what you are suggesting to me. Accept responsibility for completing a race? Simply put every single volunteer and competitor is out there for a different reason. As I said in my previous post, completing the race would come at a huge cost to my race next month. The number of things that I take into consideration is large. If a volunteer was working a shift and continuing their shift would mean they would have to give up work (and pay and benefits) do you think they would do it? If a volunteer was struck and injured on the bike course would you expect them to stay? If a competitor was out there and finishing meant they couldn't work for a period of time without pay and benefits would they continue? If you are a 9-5 person, have you ever left the office early? Have you ever made a personal call or scheduled an appointment on the company's time? Are you a professional by doing that? Was I a professional out there if I took some of the turns cautiously when I could have gone faster? It all comes down to the eye of the beholder. Often times we make decisions for a certain reason that many people will not often understand but less I tried in writing. Did the other 8 pro's who did not finish. Did they have a written explanation of the day just a few hours later? Ultimately their are few job requirements and many different ways to get to the top. This is my path. However, I think the biggest thing here is that racing Ironman affects the body to much greater degree than many people realize. It is similar to what is going in football with concussions. The difference is that the people playing football with concussions will at least be provided medical care or be able to afford care. That is not the same for Ironman triathletes. 70.3 and Olympic racing is much different. Finishing an Ironman is always risky. Why do the packers pull Aaron Rodgers out of game 15 and 16 of the season? Athletes not finishing happens every single day across every single sport.I can assure you if I had an agent or coach that yes I would have not even started but less I tried. And when I put "raced" in quotes I did not mean to the best of your current abilities. I really mean about making true sacrifices. That means leaving your job and a steady income to live a transient life where you have no home. Give up every sense of comfort that you have in life. Say goodbye to meaningful relationships. Sleeping on floors. Giving up all sense of a normal life. The list goes on and on. And don't get me wrong I love it and have chosen to do that, but to finish the race should mean that I should be fired from my job. That I am not a true professional. And there were just a couple of other qualifiers in there as well. While not everyone may understand the decision, they should at least have respect for it. Not many people on this planet do multiple IM's in a year, much less month to month. TG is a pro with tons of experience. That experience has taught him what is best for his body and his career. It's his choice to make and no one else's.